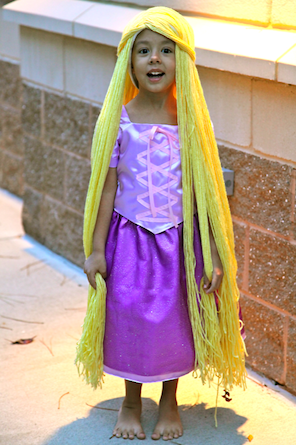 For months Sofie’s been sure of one thing–she wants to be Rapunzel for Halloween. 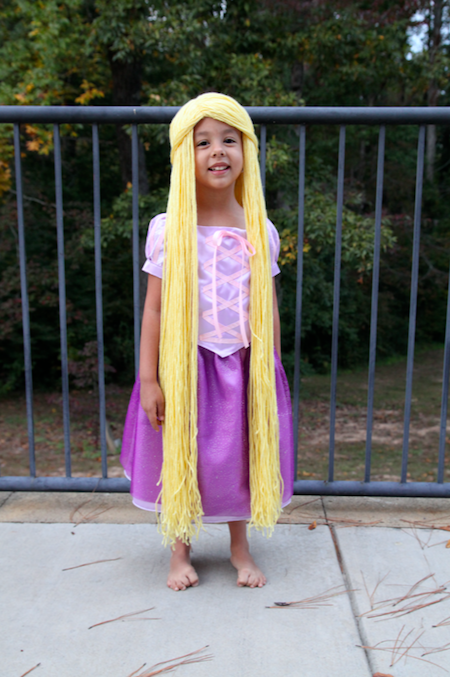 I tried to show her costumes online and in stores, but each time she demanded I could make a prettier Rapunzel dress. At first I was flattered, then I got nervous. She’s quite critical (aren’t all 4 year olds?!) 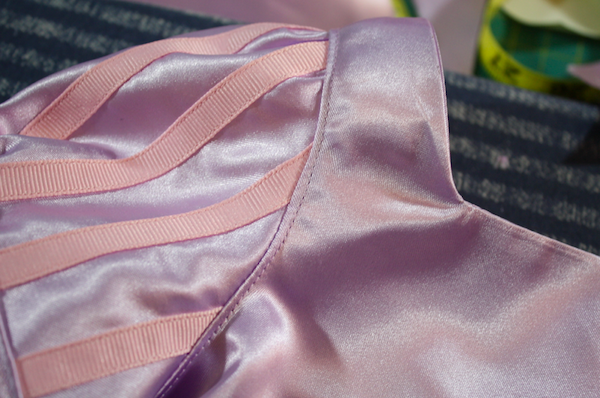 and I’m not a pro at silky fabrics, but I set my mind to it and I’m thrilled with the results! Sof’s pretty over the moon, too, and begs me every day to wear her dress. She’s anxiously counting down the days until Halloween so she can wear it all day! I was surprised at how easily all the parts came together! There were moments when I thought it wasn’t going to happen, it was going to defeat me. But the excitement and pure joy on Sofie’s face kept me working late into the night. 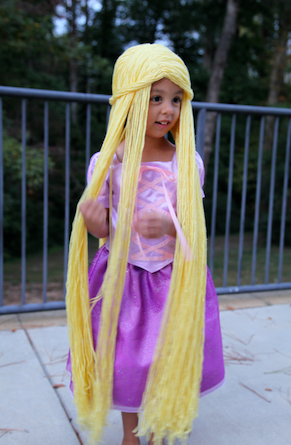 When she’s fully dressed with her wig on, she goes into complete Rapunzel mode. She calls me “Mother” and her sisters become Eugene (she refuses to call him Flynn Rider) and Pascal. And she still tries to open doors and fetch objects with her hair! But mostly, she looks at herself in every reflective surface possible! Like I said, it came together a lot easier than I expected, especially since I made it up as I went along! and a tee for the length of the front and the sleeves. 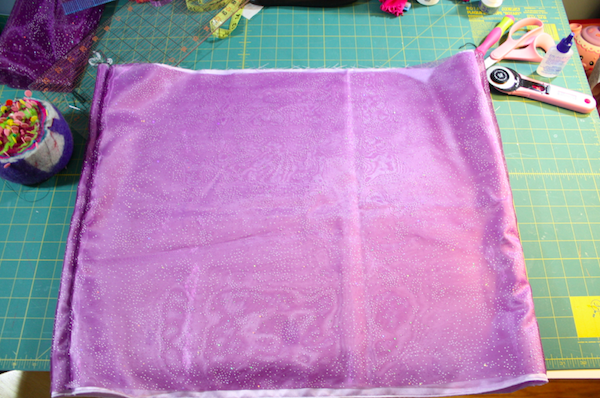 I made the sleeve piece a little bigger so I had more fabric to gather to add more puff. 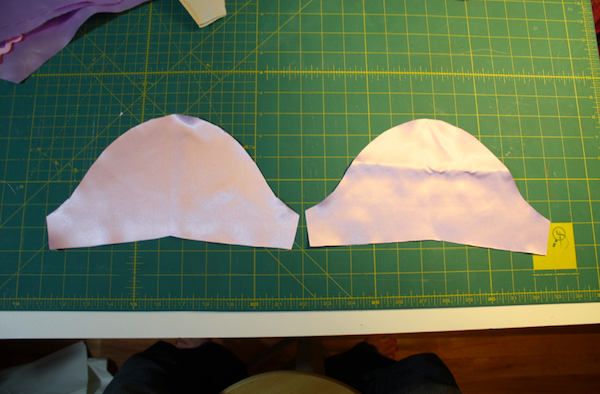 I cut my front bodice piece on the fold and used it to create 2 halves for the back. The back pieces had a little extra room in the middle so they could overlap to close the top. 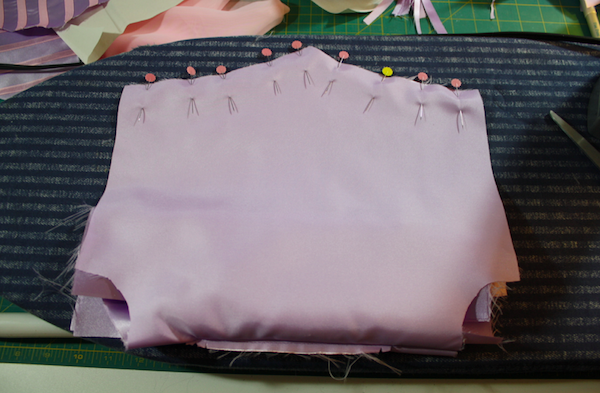 I ruined my first bodice and had to start over because I was trying to skip steps. 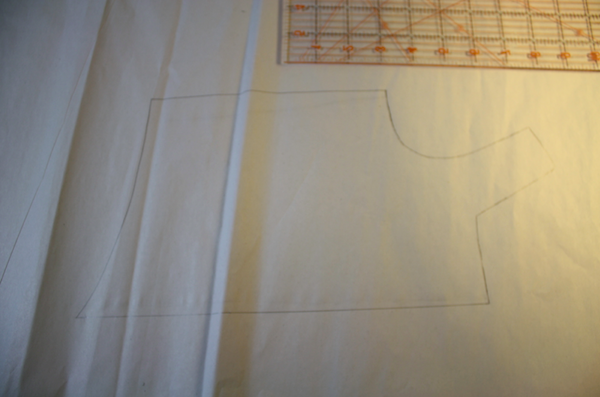 I learned very quickly that the easiest way to make this top is to line the inside. 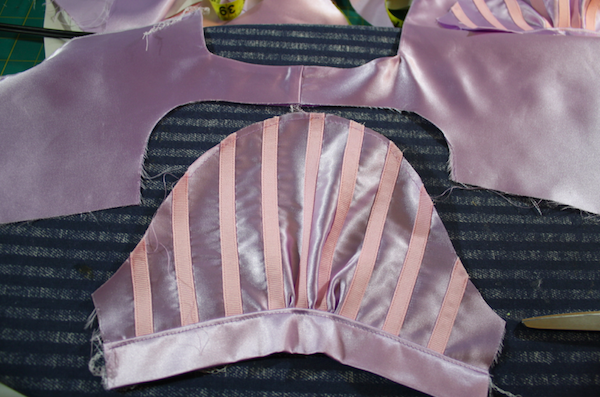 So I cut a second bodice front and 2 more back pieces. 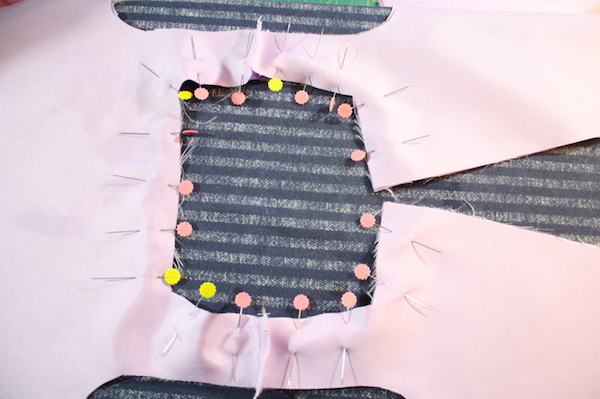 I started by taking one front and the 2 back pieces and sewing them together at the shoulder. 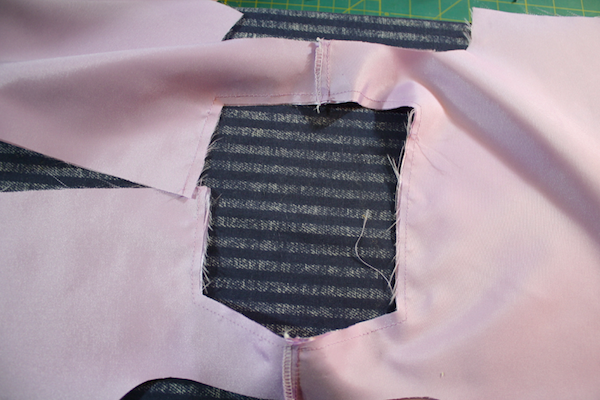 I serged the seam and pressed it towards the back. 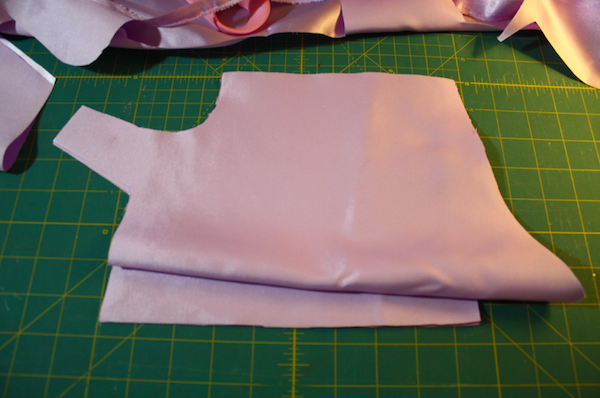 I did the same for my other 3 pieces to create a second identical bodice that would serve as the lining. Then I opened the pieces up and put them together, right sides together, and pinned all around the neck. 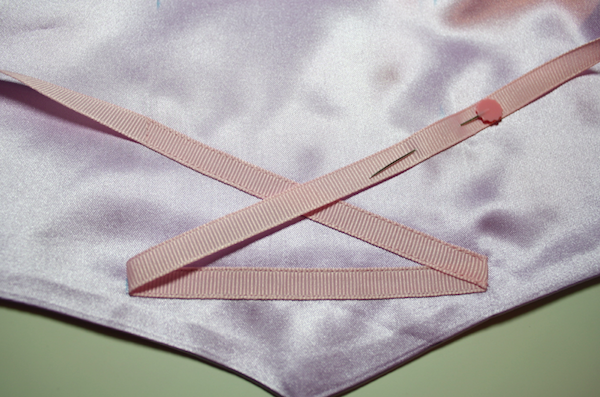 I stitched them together using a 1/4″ seam allowance. 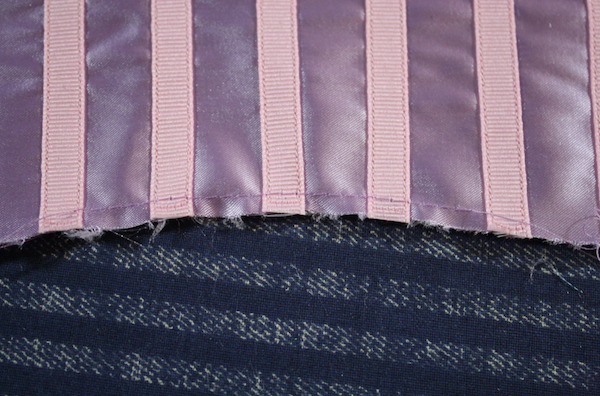 When finished, I cut little slits into the corners to help the fabric lay flat once turned and pressed. 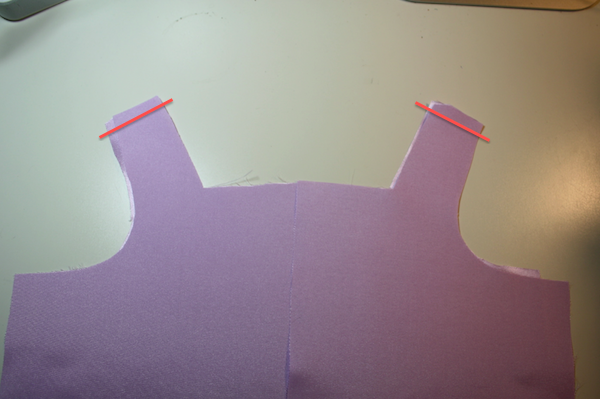 I then turned right sides out and pressed the neck seam. 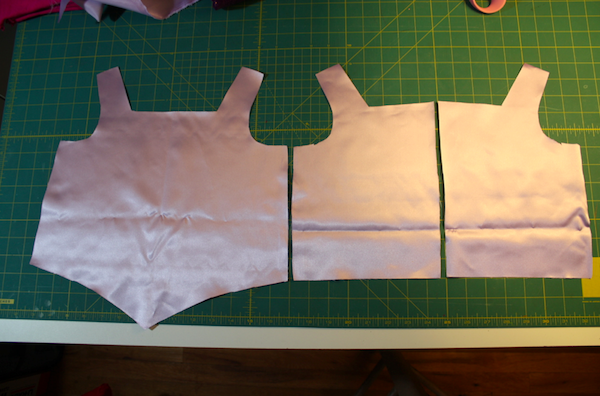 Then I turned the bodice back inside out and matched up the bottom of my two front pieces. I rolled the back half between the layers to keep it out of the way. 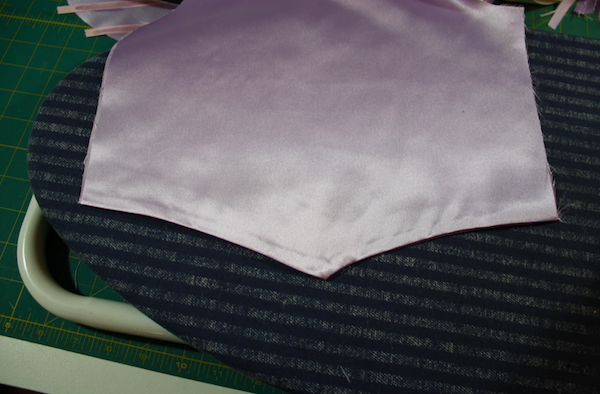 I stitched it at a 1/4″ seam allowance, then turned it and pressed the seam. I did the same with each of the back bottom pieces. Now put the bodice aside and get your sleeve pieces. I cut 2 sleeves on the fold. They’re a little crooked, but worked perfectly! 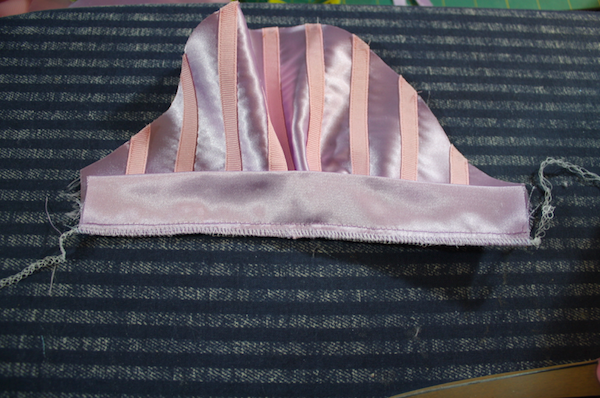 I knew the easiest way to get the pink stripes on her sleeves would be to sew pink ribbon on them. 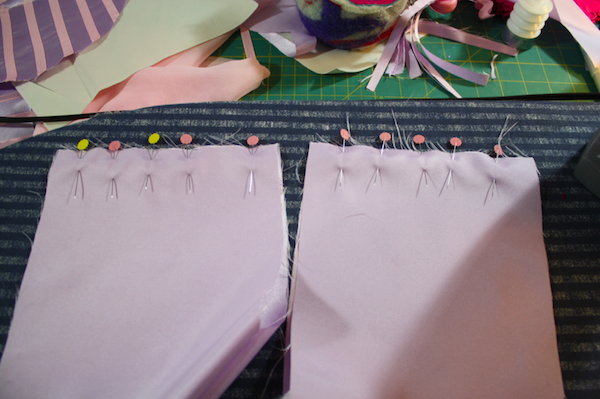 I didn’t measure, I just placed them about a finger width apart and stitched them on. 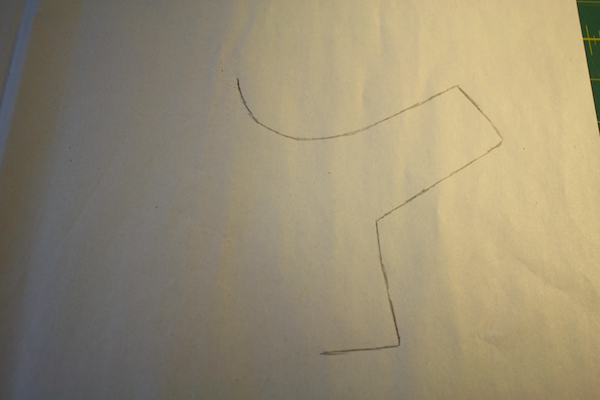 I measured around her arm, added an inch and a half, and cut a band 2″ wide by 8″ long. I folded the band in half, with wrong sides together. Making a long basting stitch over part of the bottom of the sleeve, I drew up the gathers and sewed the band to the bottom of the sleeve. 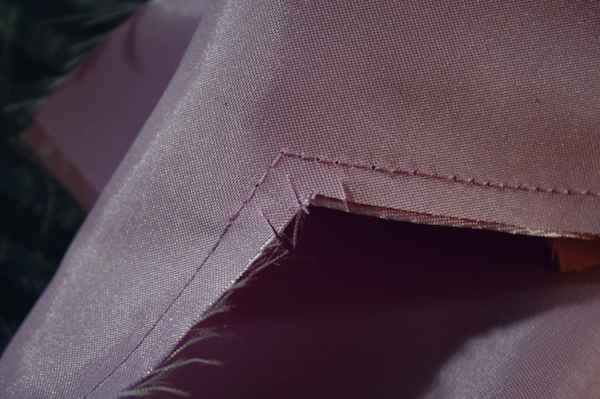 I then serged over the raw edges and pressed the seam toward the cuff and top stitched it down. 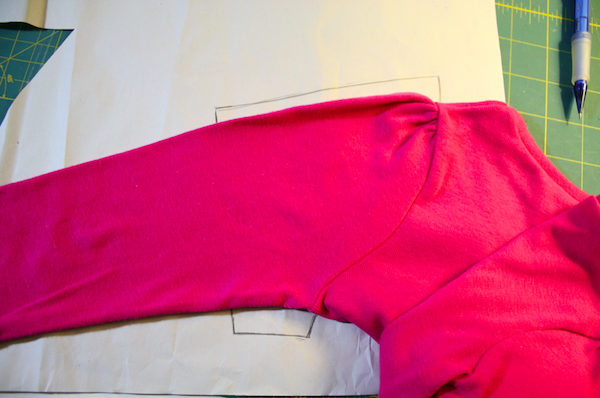 Next I did basting stitches across the top of the sleeve. 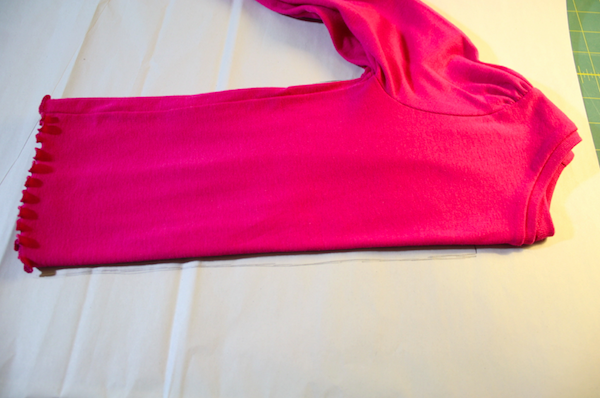 Get the bodice piece back out and match up the middle of the sleeve with the shoulder seam. 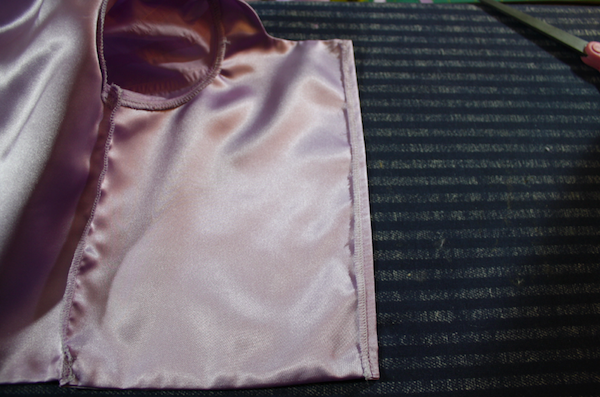 Then flip the sleeve over, so right sides are together, and pin the sleeve to the arm hole, drawing up your gathers to fit. 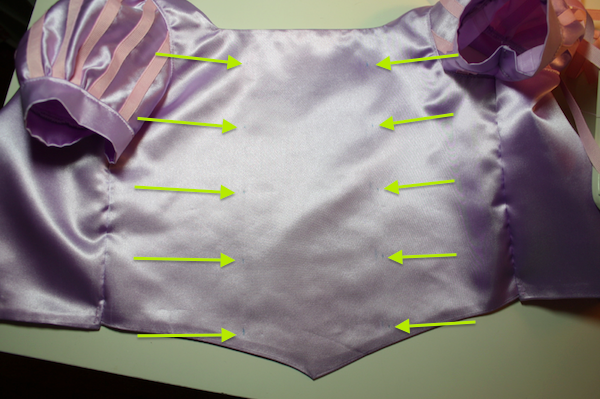 I sewed the sleeve to the bodice at a 1/4″ seam allowance, then serged my raw edges. 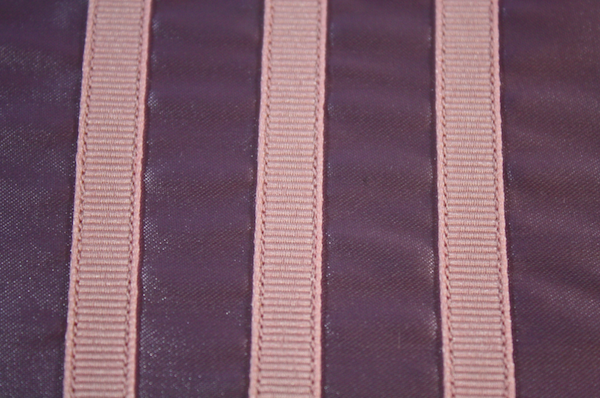 Then top stitch the seam to keep it in place. I would normally do the other sleeve at this point, but I was trying to get this half finished before Sofie went to bed so I could be certain it would fit her. So, do the other sleeve in the same manner! 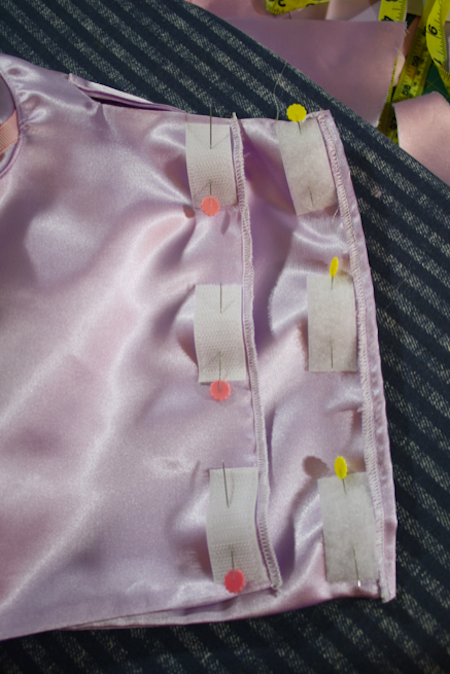 Pin the bodice on the sides with right sides together, starting at the bottom and continuing up through the sleeve. 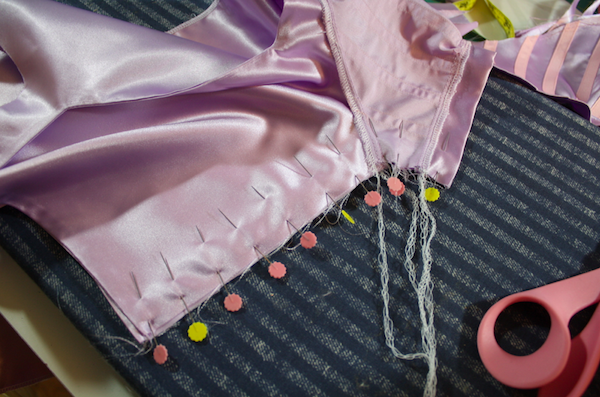 Sew them together using the seam allowance necessary to fit your little Rapunzel. For me, it was still 1/4″. Serge the raw edges. 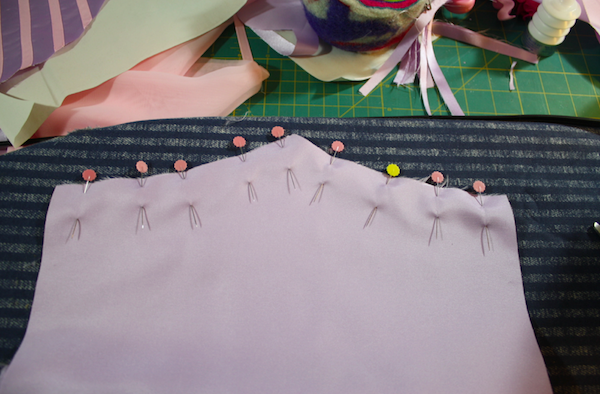 The only raw edges left on the bodice at this point are the 2 sides of the back that overlap to close the top. So serge them and fold them over and stitch down. 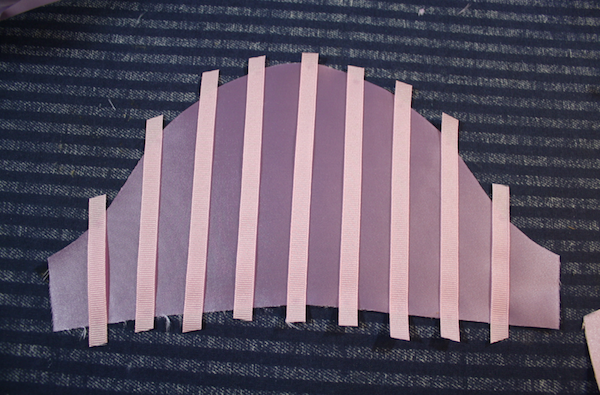 I cut 3 pieces of velcro about 1.5″ long each and pinned them on where I wanted them to go. 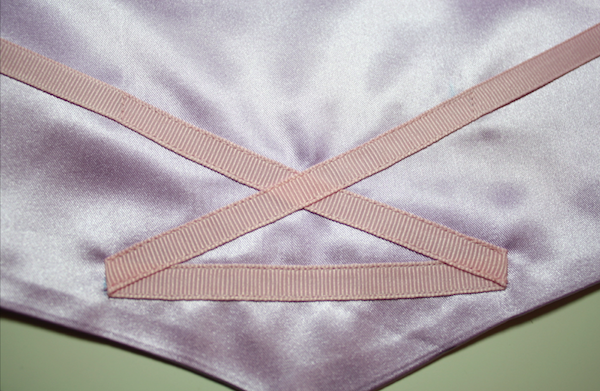 I stitched them on and finished the construction of the top. 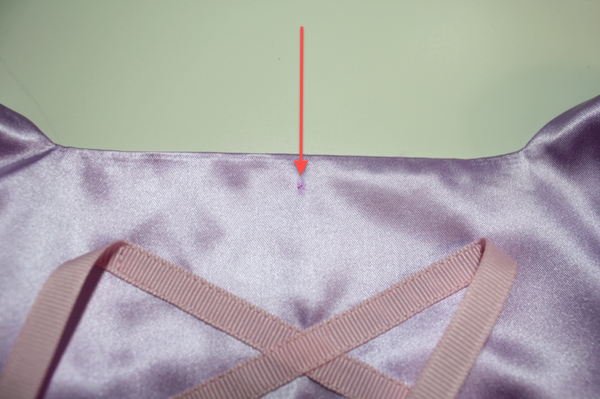 To do the ribbon lacing on the front, I measured and made little dots with a water soluble marking pen. I made my dots 4″ apart width-wise and about 2″ apart height-wise. I then pulled off a VERY long length of ribbon, found the center, and placed it across the bottom, pinned at each of the dots. Then I carefully stitched in it place. 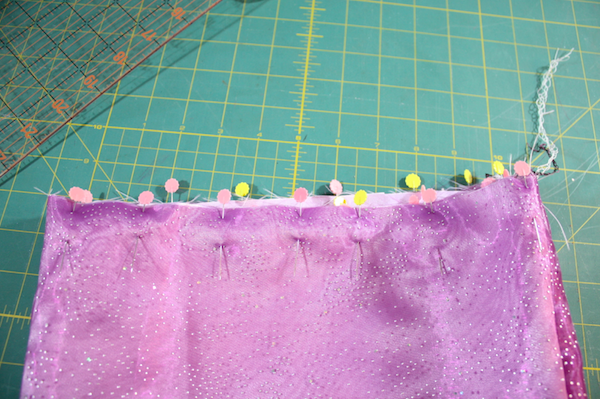 Then I pulled the right ribbon across and matched it up to the next dot up on the left, pinned, and stitched it down. 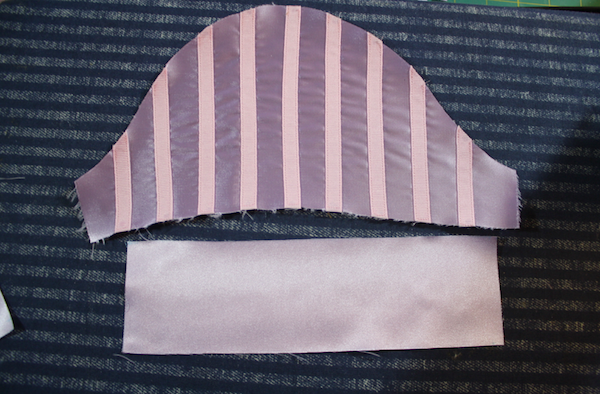 I repeated for the ribbon on the left, bringing it to the right side. 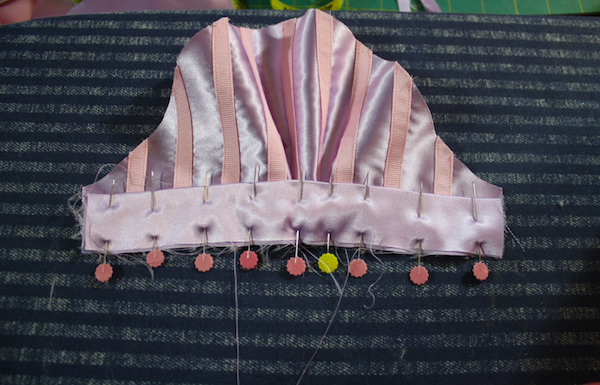 I continued on in this manner, doing the right piece, then the left, crisscrossing them back and forth up the front of the bodice. When I got to the top dots, I needed to bring them to the center to make a bow. So I measured down a little from the top and made a dot in the center. 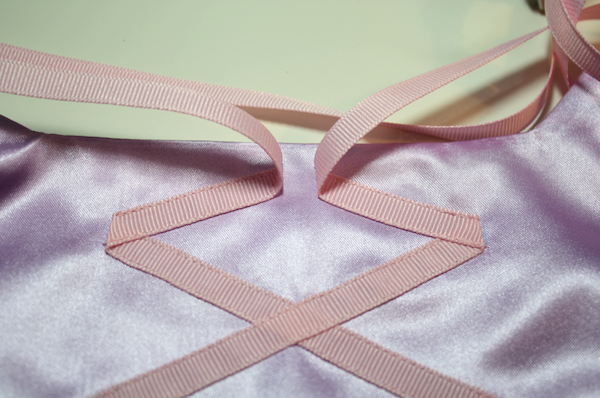 I stitched the ribbons to just shy of the dot, leaving a small space between them to make a nice bow. 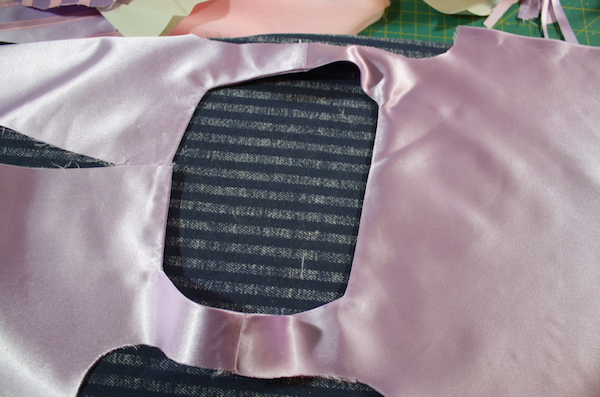 And a view from the inside of the bodice. The top is now finished! 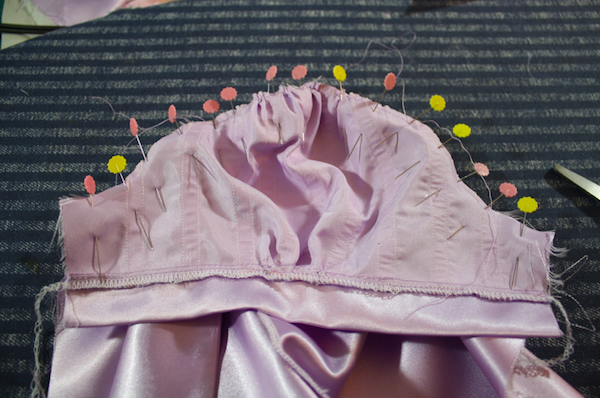 Moving on to the skirt. At this point, it was very late at night and I blanked on taking a few pictures, so I’m going to do my best to explain the steps that are missing photos! To make the skirt I used all the fabric I had left. 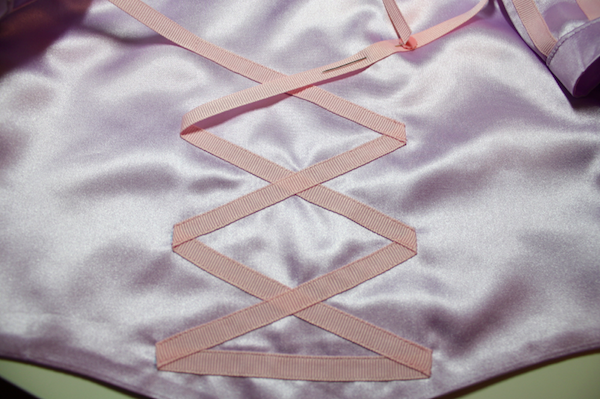 I was so thankful I bought extra and could make a second (and technically third since it was fully lined) bodice. 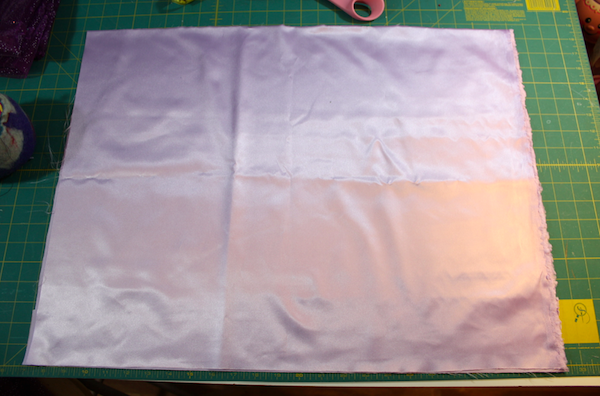 I cut my remaining fabric in half and got 2 pieces that were 25″ wide and 19″ long. 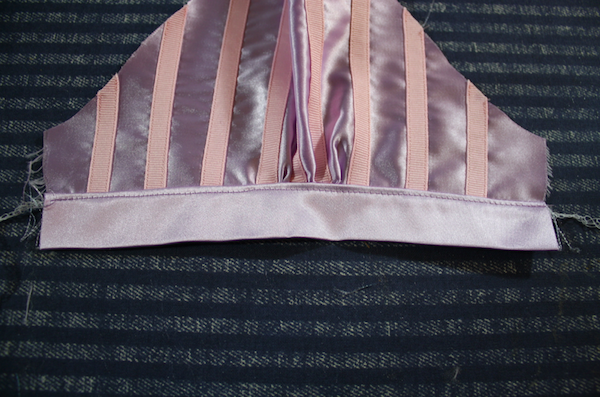 I placed them right sides together and sewed and serged the side seams. Here’s where I blanked on pics. 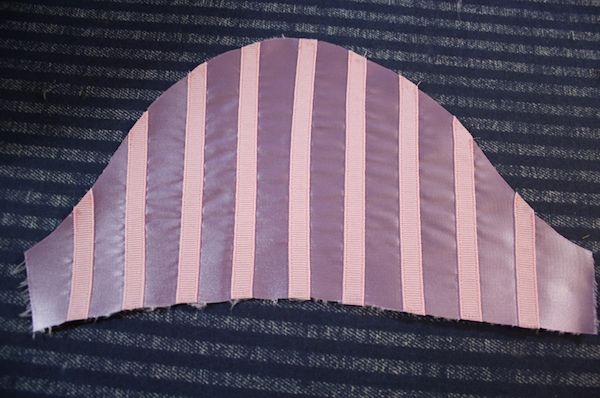 I have the dark purple meshy overlay for the skirt and I cut it the same size as my main skirt pieces, placed it right sides together and sewed and serged the side seams. 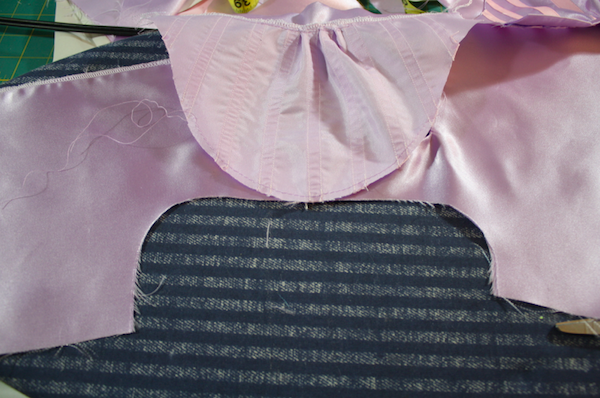 Then I decided to finish the bottoms of the 2 skirts. 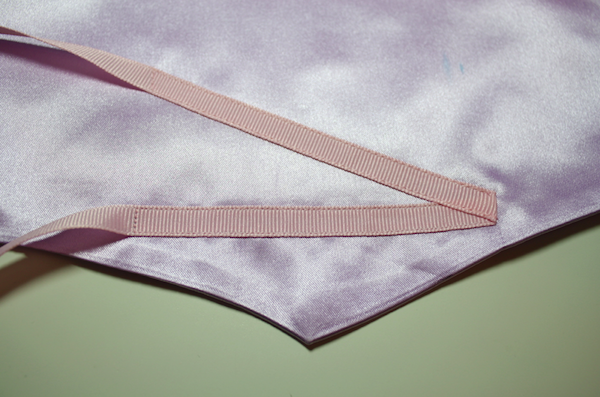 I did a rolled hem on the inside, light purple skirt. 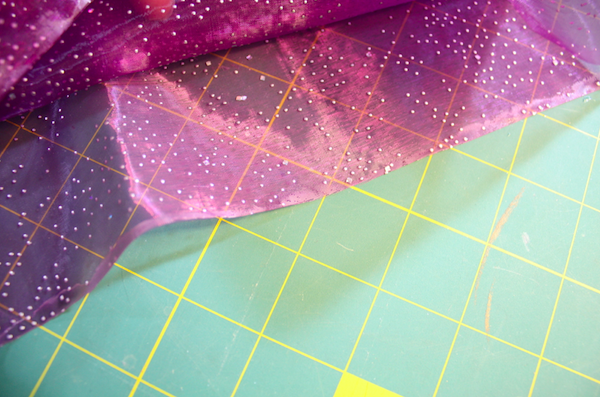 I went to do a rolled hem on the meshy, dark purple skirt and my serger started eating the fabric. It looked horrible. So I cut it off and started brainstorming alternate hemming options. In the end, I chose to “seal” it with fray check. It was a messy process, but I coated the bottom with a nice layer of fray check and it sealed it off! It ended up about an inch shorter than the light purple layer, but I loved it that way! You can barely see the dried fray check. 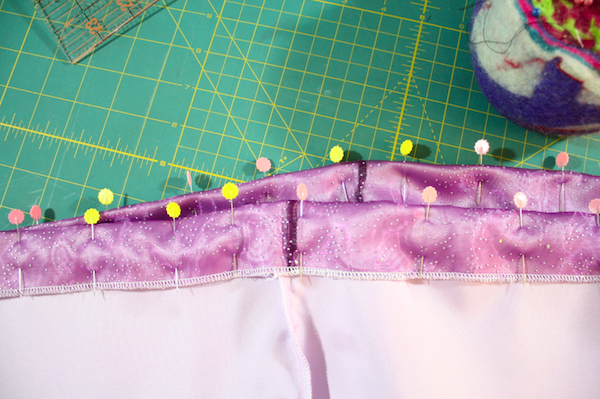 Then with both skirt pieces turned right sides out, I put the dark purple mesh over the light purple skirt and lined them up at the top, pinning as I went. 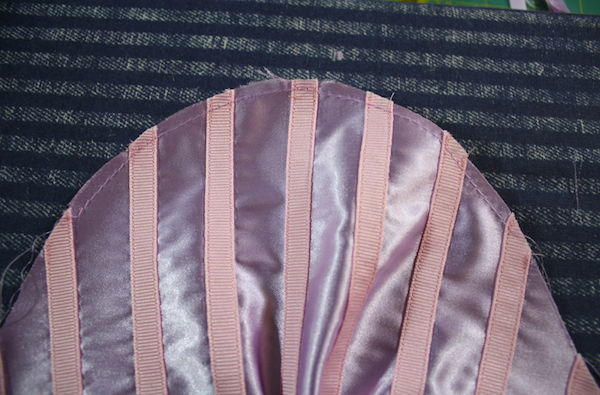 I stitched them together at the very top to hold them together, then serged around the top of the skirt to finish the edges off. 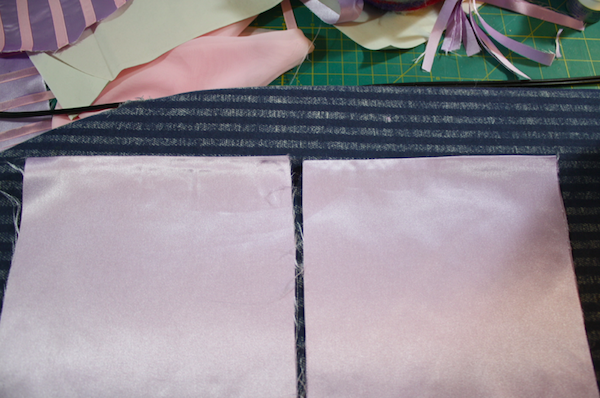 I then folded the top over 1.25″ to make a casing for my 1″ elastic. 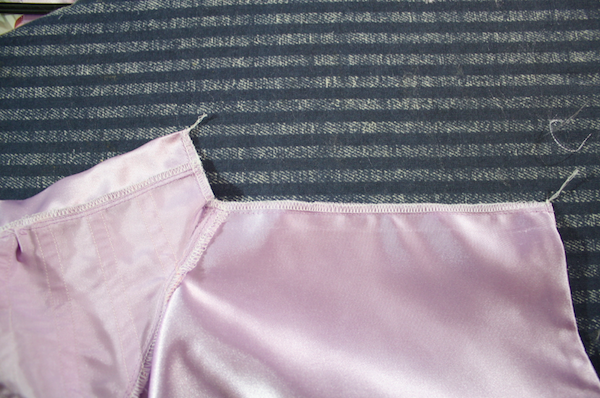 Threaded my elastic through, stitched it together and sewed the hole in the casing closed and I was finished! And she is THRILLED! 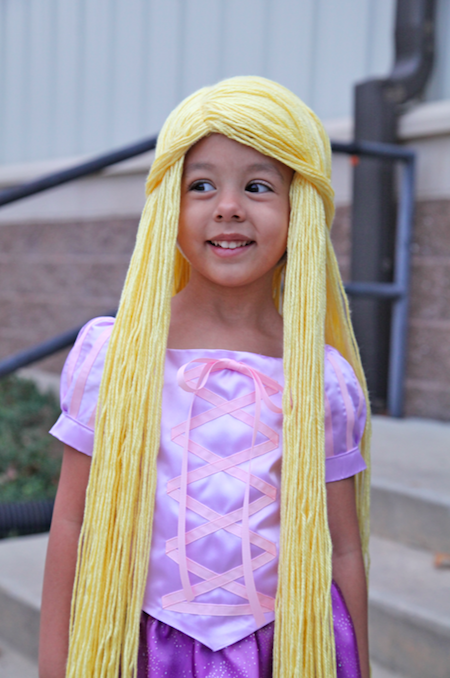 That is so spooky; literally two hours ago I was looking up your old post where you made the Rapunzel wig so that I could attempt it for my daughter and I was going to try and throw something together for the rest of the outfit. 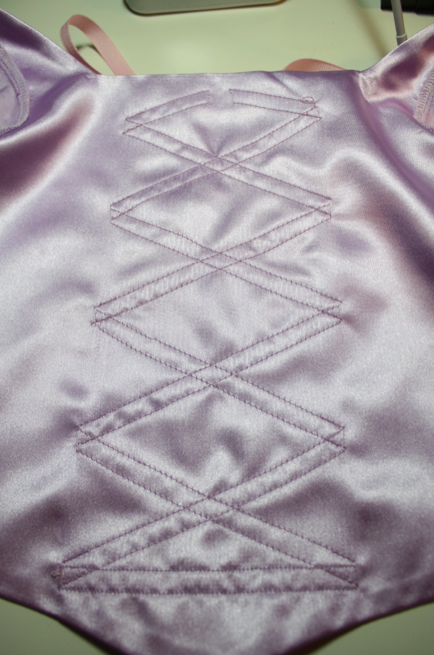 You have made such a beautiful dress here, thank you for all the detail on how you made it. 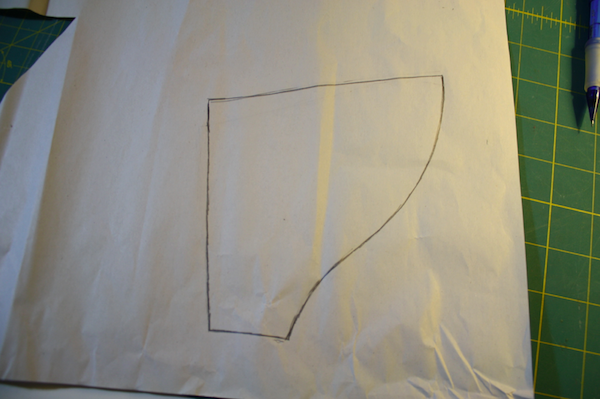 Mine will be significantly less well made as was planning to add sleves to a vest top and attach a shirt to that. Think I definitely have to have a rethink now! You did an awesome job, Mama! Look at that big smile. 🙂 Thanks for sharing the process, as well as the results. So fun! wowee!! Great job!! 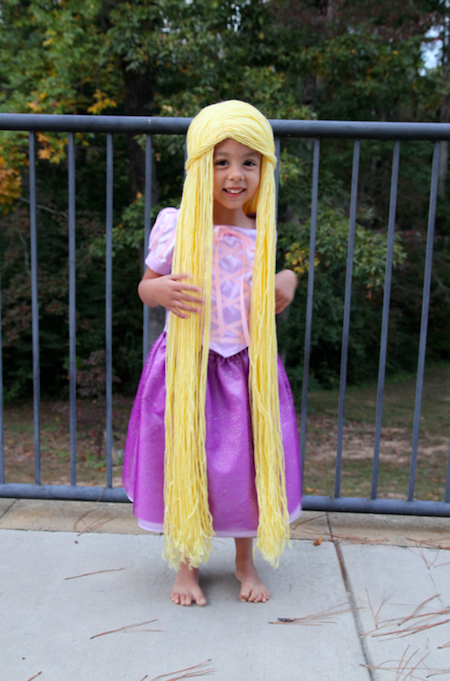 I am sure she will be the prettiest princess on the block. I cannot even imagine being able to make that. LOL I am impressed!! So cute! I also was ‘winging it’ with my daughter’s costume this year-she’s two, has curly red hair, and fell in love with Merida when she saw “Brave” this summer, so how could I not dress her up as the Highland lass? Let’s just say that medieval style patterns don’t exist to fit a 25 pound toddler, so I was flying by the seat of my pants. It turned out well, so I’m happy (and she’s been running around in her dress most of the day today). 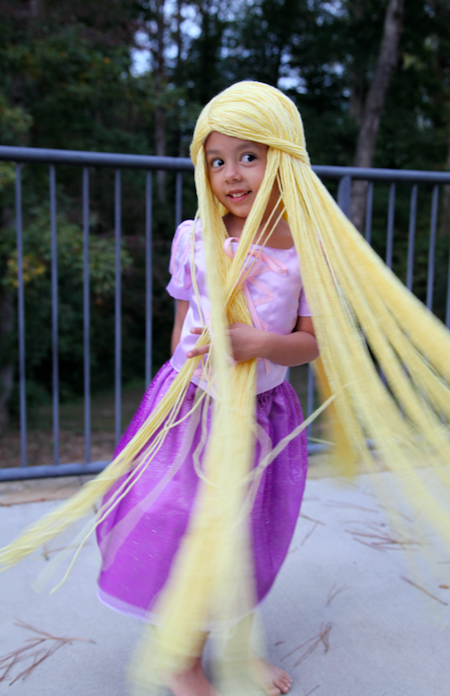 I suspect she’ll want to be Rapunzel next year, so I need to remember this page. Very cute! 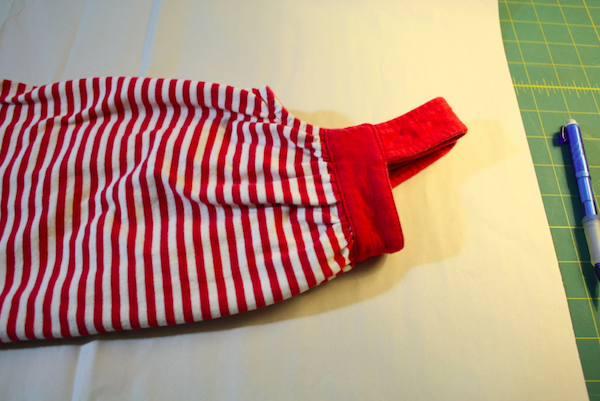 I love the idea of two pieces – I can see some fun mixing and matching in the Tickle Trunk later! Beautiful costume, and a great tutorial! You did an amazing job with the hair, very cute! Oh so cute, looks much better compared to the costumes you can buy in stores. 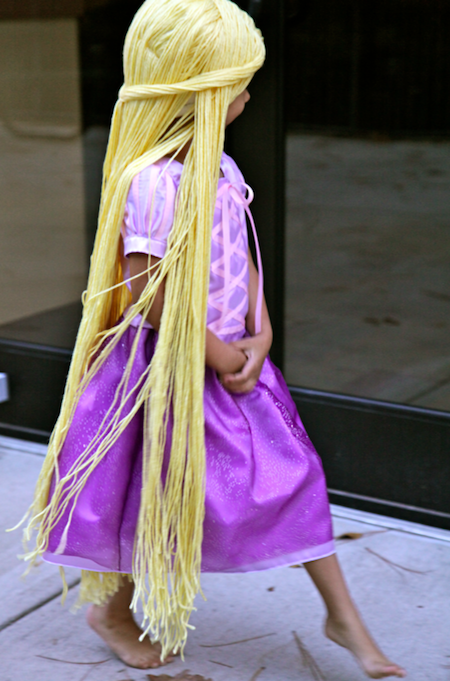 Especially like the custom made long blonde wig, very original. Wow! That helped a lot. I think I will make some changes to mine though. Maybe a good idea would be adding lace trim…? Thank you!